Toxic levels of air pollution (see Beijing, New Delhi and Paris), contaminated land and waters – the drive for unceasing GDP growth and our desire to acquire an ever greater number of “things” is killing off other living things at an unprecedented rate and poisoning the ecosystems upon which human civilization has been built. Compounding the problem is an unprecedented rise in mean global temperatures that dates back to the dawn of the Industrial Age and our addiction to fossil fuels. Clearly, we need to find and make use of new, more sustainable ways of urban planning, design and living. 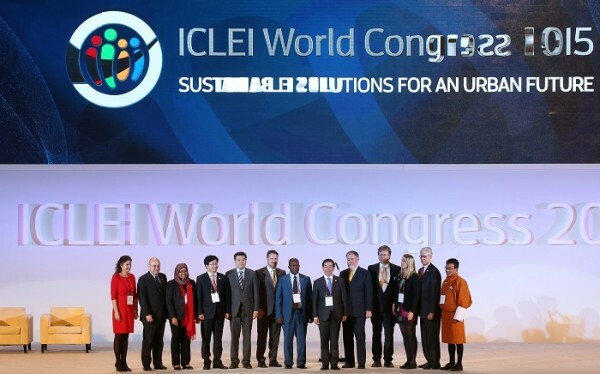 Gathering in Seoul for the 2015 ICLEI – Local Governments for Sustainability – World Congress 36 major city mayors pledged to take action to reduce GHG emissions and address climate change. With global GHG emissions continuing to rise despite best efforts to date to reduce them, ICLEI’s new Compact of Mayors takes on added significance as governments of the 195-plus nations party to the UN Framework Convention on Climate Change (UNFCCC) prepare to finalize the terms of a new global climate treaty at the 2015 Climate Conference in Paris this December. Forging “green” economies and building smart infrastructure. Aiming to foster, accelerate and share information and other resources regarding promising climate change mitigation and adaptation technologies, policies and projects ICLEI also launched the Transformative Actions Program (TAP). Under the umbrella of the new Compact of Mayors, a core element of TAP “is to select 100 promising transformative projects ahead of the 2015 Paris Climate Conference with the aim of enhancing capital flows to cities,” ICLEI highlights in its press release. “One of the most effective ways cities are fighting climate change is through the Compact of Mayors,” the UN Secretary-General’s Special Envoy on Cities and Climate Change and former mayor of New York City Michael Bloomberg was quoted as saying. Part and parcel of membership in developed and developing country ICLEI cities including Johannesburg, Montreal, Paris and Seoul are required to register “climate mitigation and adaptation targets, report vulnerability assessments and emissions inventories using the global standard GPC on a recognized public reporting platform such as the Climate Registry or CDP Cities,” ICLEI explains. Chihuahua (Mexico), Medellin, (Colombia), Recife (Brazil), Itu, San Rafael de Heredia (Costa Rica), Temixco (Mexico), Toluca,(Mexico).